In my previous text a few months ago, I have given a few details about the new Aether AG series, and in this Osprey Aether AG 60 review, I give more information about this particular pack from the series. This is the ultimate backpacking tool with some extraordinary features, so keep reading. The most advanced suspension system so far. A few differences in numbers (size and weight). The first change is very visible. The second becomes obvious only after you remove the lid, and then what you see is truly amazing. When you have so many things to describe, it is hard to choose where to start from. 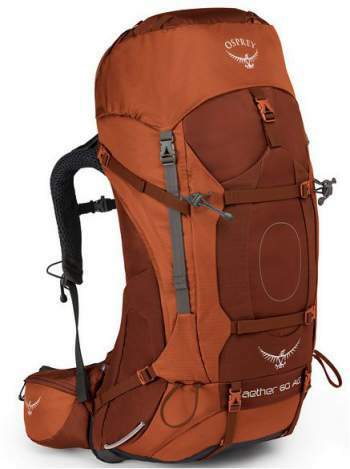 Aether AG 60 is the smallest in the series which also includes the packs of 70 and 85 liters. The number 60 in the name describes it official volume, but in fact, the pack comes in three different sizes/volumes, of 57, 60, and 63 liters. In addition to this, its harness is adjustable. If this is not enough, its harness comes in 4 different sizes to chose in the moment of purchase, S, M, L, XL, and the same holds for the hip belt. So imagine, you have so many options to choose and to adjust for an optimal fit. This is a top loading pack with a removable lid, but it has an extra access point on its left side. But, I guess it is the AG suspension that has caused most excitement, so to say a few words about this first. You can compare it with the previous version described in my earlier post. You can see very easily that this version of the Osprey’s AG system is quite different from their starting design used in the Atmos and Aura series, and in some smaller packs like Mira and Manta. This is definitely not the continuous seamless mesh which you have in the original AG design. In fact, I am not completely sure why they call it AG, perhaps it was just a shortage of proper terms. 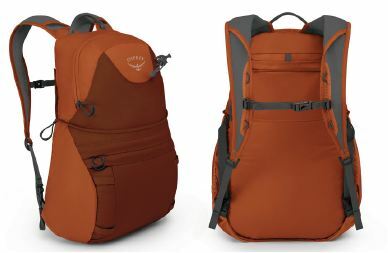 Have you seen the latest version of the Osprey Stratos and Sirrus packs? Well, have a look in my another text, and you will realize they call the design used there ‘AG inspired‘. I must say that what I see in the Aether 60 AG, looks less AG than what I see in the Stratos and Sirrus packs. But this aside, the tensioned mesh on the back of Aether AG 60 looks really cool and it is completely different by the structure. In fact, what I see here, looks more like the mesh in the Deuter Futura series, but do not understand me wrong, this is a completely different system in general. Osprey’s oven for molding the hip belt and harness in my local outdoor shop. The hip belt ISOFORM 5 CM is with custom heat molding, and interchangeable, so you can choose your best fit in the moment of purchase, and it will then mold naturally by your body heat to fit you perfectly. The same is with the ISOFORM 5 AG mesh harness, which is thus interchangeable and you can choose the size. The actual meaning of the word ISOFORM is that the harness and the hip belt have some break-in time and they accommodate and form to your body shape after a few wears. But you can speed this up if you wish. 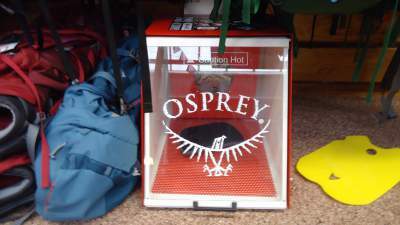 Good shops with outdoor equipment usually have an Osprey’s oven for this purpose. See this one in the picture, from the place where I live in Belgium. It is of the size of a micro oven, though a bit higher. The frame of the pack is a LightWire peripheral aluminum alloy structure. So all in all, this suspension looks really good, but I miss to see what makes it ‘anti-gravity’. See more about it below. All you have to do is to slide your hand between the back panel and harness and to release hook and loop attachment. Then move the harness into the desired position. There are indicators which will guide you. The hip belt in this new pack is removable/replaceable just as it was in the “old” version of Aether. So, as you realize this is an advantage and an extra bonus of this series (in both old and new versions). Family members or partners can use the same pack, but they may use their own specific (molded) hip belt and harness to ensure a perfect fit. How better can it be? On the front of the pack, you can see two vertical flaps with horizontal straps, this is the part of what they call dual front compression system with StraightJacket compression. This is visible in the first picture above. So, when you undo them, you will see that underneath the flaps there are 4 attachment loops. These loops are there to attach Osprey Daylite pack, which itself is designed for such a purpose and it can be added to many of Osprey’s packs. So the Aether 60 AG is not an exception in this sense, but it is important to point out this bonus with the pack. When the Daylite pack is attached, you can additionally secure it with the mentioned two horizontal flaps and the straps. On the top of the lid you have an external zippered pocket, and on the top of this pocket, you have yet another small pouch. I am simply delighted with what they have done here. Contrary to the previous Aether version where you have the removable lid that serves as a lumbar pack for short tours, in the new version you have a fully functional backpack. This is what they call the DayLid daypack, with no less than 16 liters of volume. Shoulder straps with mesh and edgeless wrap. Dual access to the main compartment. Apart from the main compartment, you also have a zippered pocket. There is even an external hydration sleeve with a hanger for the water bladder. On the bottom, there is a tuckaway attachment loop which is paired with a bungee cord on the top, to attach an ice axe. The sternum strap of this DayLid pack can be fixed to three different positions, you have loops for this purpose on both shoulder straps. So those loops that are not currently used for the sternum strap, can be used for attachment of equipment. Since this pack is the lid itself, the attachment loops that are normally on the top of the lid, are now on the front of this daypack, so imagine, you have 4 extra attachment points of course. This all is simply ingenious. When the lid is removed you have an additional flap with buckles to close the big pack properly. So it again looks like a normal top loading pack, yet considerably shortened. There are many other useful features here, but this is the same what you have in the previous version as well. Here are some most important. Internal reservoir sleeve is with a buckled loop to clip the reservoir and to keep it upright, see more below. There is a bottom compartment with the usual zippered entrance. The divider between the main compartment and the bottom section is collapsible. The pocket organization is standard; dual side stretch mesh pockets, dual zippered hip belt pockets, the mentioned pockets on the lid, and you have one large stretch mesh pocket on the front. So you have 7 pockets in total. 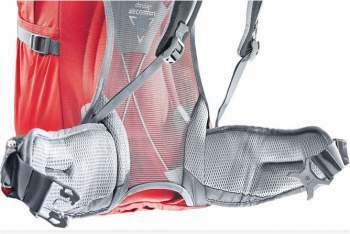 Numerous attachment points are on the pack, and they include the mentioned webbing 4 loops on the lid, two big attachment loops on the bottom and those are paired with bungee cords higher up, so you can attach two ice axes. Of course, the Stow-on the-Go trekking pole attachment system is available here as well. This is useful to have when you need free hands on the fly, to take a photo, to eat and drink something, or when you have some scramble to do. Dual compression straps are available on the sides. The lower compression straps on the sides are with InsideOut features. So they can be routed inside (to compress pack when not full to ensure its stability) or over the side mesh pockets (to secure items in them). Dual removable compression straps are on the bottom. On the front, you have the already mentioned StraightJacket compression straps and two vertical flaps. Stow-on the-Go trekking pole attachment system. The original AG suspension and the body-hugging mesh introduced there has its purpose, and the awards received for it are surely justified. But I am convinced that none of these AG versions (at least three variants are available now) can provide ventilation which you have in the tensioned mesh systems available in Deuter packs and in some other packs of Osprey, as well as in some of Gregory packs. But no need to compare with other brands, let’s keep it in the house. See below the Osprey Sirrus 50 pack on the left, and the Osprey Aether AG 60 on the right. Observe how much space you have between the pack body and your body in the Sirrus design. Clearly, the AG 3D mesh system cannot provide as good ventilation in the center back zone, and for such huge packs, this is essential. 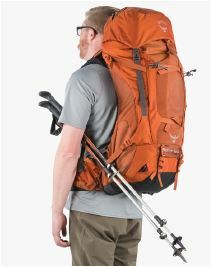 Osprey Sirrus 50 pack, side view. Osprey Aether AG 60, side view. I know that not everybody likes the tensioned mesh system because it implies a curved shape of the pack, just see the Sirrus pack above as an example. The pack’s center of gravity is shifted back from your body. Some even claim this is not good for balance and stability, but I disagree. I have been using such a system in Deuter packs in the past 15 years. Let’s see this more closely. Nobody can walk like those people in the pictures. Under the heavy pack, you will tend to lean forward. How much exactly? 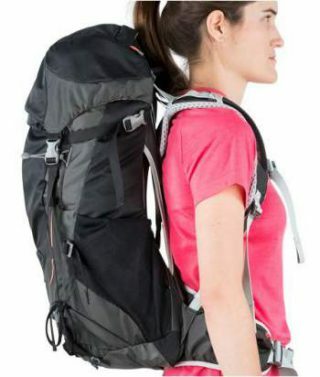 Well, this depends on the load, you will bend your upper body to counterweight the pack which pulls you back. But see the picture on the right; this means that the AG pack will make even more pressure everywhere on your back. So ventilation will be reduced even more on the back section. This is completely impossible with the tensioned mesh system in the picture on the left. The gap between the mesh and the pack will always be there, this is how this tensioned system works; the back of the pack is pre-curved by its frame, and this is supported by the mesh. But the situation is quite different around the hip belt area, see the “blue” picture below. There is a gap between the belt and the structure with the hip belt pockets, so the AG ventilation in this zone is better than in any other system. There is more about this, please see below about the issue of “external” hydration sleeve. b. 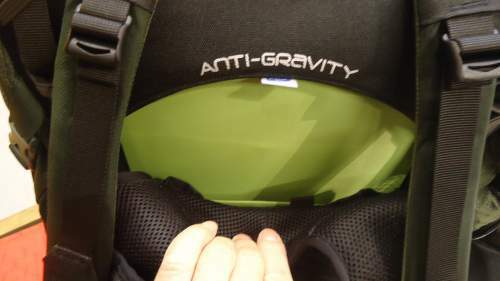 Is there really any anti-gravity? Some “explain” the AG effect as the difference between when someone is leaning on you and someone hugging you. Apparently, the latter should be better. But hey, do I really want that a 27 kg pack hugs me so tightly? I think I would rather have some space between it and my body. To answer this question about the (anti)gravity, see again the pictures above. The pack’s gravity only acts vertically, and there is a momentum of force so the pack will effectively pull you backward. This is a bit of physics, my favorite subject (I am a theoretical physicist). So, when you carry a heavy pack you cannot walk upright as the person in the picture. You will have to lean forward. This means that the pack’s gravity center will be shifted forward and it can even come to a position above your bottom, or very close to your body in general. Now, when this happens, the whole pack’s surface which is in contact with your body, will distribute the weight. The bigger distribution, the better. This reduces the usual hot spots (but as mentioned above, this also reduces ventilation). From this, it can easily be concluded that the mesh in the Aether AG 60 pack will indeed work. It hugs your back and it will distribute the weight. But guess what? The same holds with any back system of any pack. The same will work with the Sirrus pack shown above, or with any of Deuter’s packs with suspended mesh. The mesh will get more in contact with your back, but the ventilation in packs with suspended (tensioned) mesh cannot be reduced due to reasons explained in the item a. above. Though, the effective surface in contact with your body, as created with the AG mesh, is indeed larger. On the other hand, I am convinced that a pivoting hip belt and harness (available in some top brands) makes more difference than this hugging AG belt. These pivoting systems truly follow your body movement. 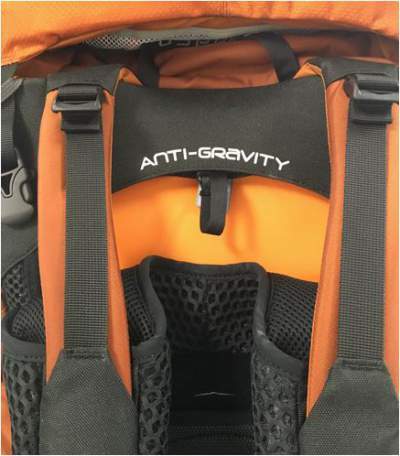 My conclusion: the mesh system on the harness and on the hip belt of the Osprey Aether AG 60 pack looks really great by appearance, but I am convinced that the anti-gravity here is more a phrase than a physical fact. We simply shouldn’t attribute to it effects that do not exist. In the end, it is always the hip belt which is supposed to carry the load, and not the rest of the harness. You do not want to feel it too much on your back or on your shoulders. See a bit more related to this issue in the next item. The lumbar zone in Osprey Aether AG 60. Such a structure has been in Deuter’s packs for many years, but only in their small packs. See one of them below, from Deuter Futura 32 (the picture on the left). So this design is nothing new. 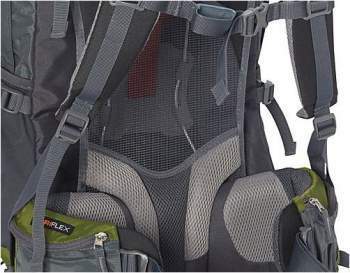 But with bigger packs, such tensioned mesh systems always include a generous padding, which you can see in Deuter Futura Vario 60 (the picture below on the right), and also in Gregory Zulu 65. Lumbar zone without padding in Deuter Futura 32. Lumbar zone with padding in Deuter Futura Vario 60. Please see how the Aether AG 60 compares with some other top-notch tools. It is in between the other two by the volume, but it is heavier. Please follow the links to see more. *See below some comments on this issue. I am a bit puzzled with what makes the Aether pack so heavy. Both Deuter and Gregory packs are also with metal frames. 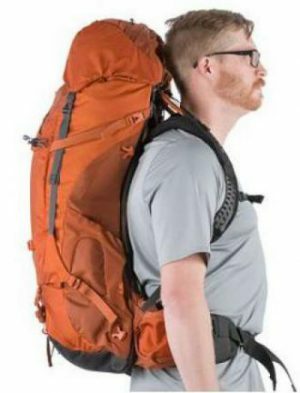 Also, as you have realized, there is no massive lumbar padding on the Aether pack as you have in both Deuter and Gregory packs. the daypack (big thanks to Vik for pointing this out). See below about these issues. ♦ It is possible that on the US market the pack comes without a rain cover, I am from Europe and cannot check independently. I have seen a YouTube video with the statement that the pack bought at REI is without the cover. In the description of the pack on Amazon there is no rain cover mentioned. So it is possible that the cover is not there. However, in my local shop in Belgium, the Aether AG 60 pack comes with the rain cover stored in the top lid pocket, see the picture. The price of the pack with the cover is 249 Euro. ♦ About hydration sleeve: Equally confusing is the issue of the hydration sleeve. Even in the Osprey’s video (given here in the text), there is a statement that the pack comes with an external hydration sleeve. However, I have had the pack in hands and can confirm that there is no external sleeve in this pack. The space behind the harness is not a sleeve. However, there is a space behind the harness, see the picture above, but this is not a water bladder sleeve. If you put anything there, you will not have proper ventilation on the back. Besides, there is no hook or loop to attach anything there, so whatever you put will slide all the way down to the lumbar zone. The pack available on EU market is with standard internal hydration sleeve, with a hook on the top. “Hi Jovo, thanks for your inquiry. I understand that in the images there is no clip showing in order for the reservoir to be hooked onto. However, this pack does have this loop and does enable you to attach your reservoir to it and use the external hydration sleeve. “Hi Jovo, thanks for your reply. The internal loop for water bladder sleeve passed through the hose hole to be used as a loop for the so-called external sleeve. If you put a water bladder in that space behind the harness, you will not have enough ventilation. This still does not explain how they missed mentioning (both in the description and in their video) the proper internal sleeve, but OK we have an answer after all. Hi Jovo, thanks for your enquiry. The Aether that is sold with the lid-daypack conversion feature, is only sold in the US. The Aether sold in Europe comes with a rain cover instead. The US version is only available to buy outside of Europe, unless you can find it on an e-commerce website that ship internationally. If you need any further assistance, please don’t hesitate to reply or visit www.ospreyeurope.com for any general questions. Kindest regards. In a separate message, she also wrote that she passed our conversation about the sleeves to their team. So perhaps the description of the external sleeve (and about the never mentioned internal sleeve) will be updated. Hopefully, they might also change their promotion video about this series. – S: 57 liters (3478 cubic inches). – M: 60 liters (3661 cubic inches). – L: 63 liters (3845 cubic inches). – S: 2.26 kg (4.97 lb). – M: 2.34 kg (5.15 lb). – L: 2.53 kg (5.59 lb). – S: 16 – 19 inches (41 – 48 cm). – L: 20 – 23 inches (51 – 58 cm). IsoForm harness sizes to choose: S, M, L, XL. – S: < 31 in (79 cm). – L: 33 – 37 in (84 – 94 cm). – XL: > 36 in (91 cm). – S: 30.71 x 15.35 x 12.2 in (78 x 39 x 31 cm). – M: 32.68 x 15.35 x 12.2 in (83 x 39 x 31 cm). – L: 34.65 x 15.35 x 12.2 in (88 x 39 x 31 cm). So, to summarize my Osprey Aether AG 60 review, this is one of the most sophisticated backpacks ever built. I believe nobody can deny this. I love the pack, and I wonder who wouldn’t. In my view, the best part of it is the convertible lid, I have no words to express how much I love it. As for the rest, everything is the top notch what you see here, I have no doubts about it. Though I have some objections, there are a few things which I am not happy with, but the time will show how this pack really works in practice. Its price is really high, but most likely it is worth the investment. The corresponding women’s version is the Osprey Ariel AG 55 described in my another text. Note, there are larger packs from this series also presented in the site, Aether AG 70, and Aether AG 85, so please have a look. 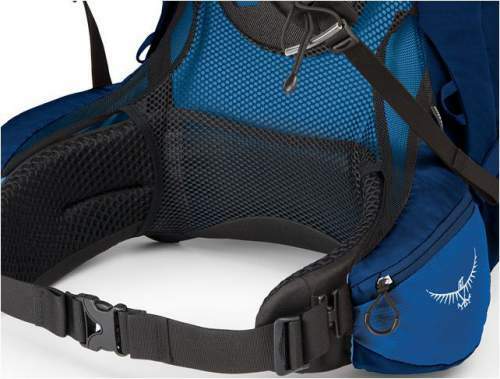 Did you ever think about Osprey Atmos AG vs Osprey Aether AG, which is better? Read here. Hi. Do you think that this is recommendable for women to use even if there is Ariel Ag 55? Hi Lara, the whole point of packs for men and women is to have a great fit. But packs are built for some ‘typical’ man and woman, whatever this may be, so this is still not a guarantee that it will be perfect for a specific person. So if you feel that Aether fits you well, there is no single reason not to use it, go for it for sure if you have a great price and/or you need those extra 5 liters of volume which Aether offers. As you know, there are so many brands that make only unisex packs, and this is still fine for many users. Hi, cannot say much because you did not give me enough data. My only guess now is that the second option is not AG, while the first option is probably just the usual 2017 AG version. I know that it is available with such a name in Amazon-India and I have no idea why they call it that way. Cannot say more now. Thanks for the review, Jovo! You can always buy a foldable daypack separately. They don’t take up much space (you can even get some that will fold up into a tiny pouch), shouldn’t be too expensive… and a good one will hold up well (of course I can’t comment on whether or not the quality of the DayLid is superior). Of course, it doesn’t quite have the same cool factor as having the daypack built into your primary bag, but practically speaking, it’s a solution to your needs. I understand that part of why Osprey went this way is to cut costs in Europe… so hey, you’re actually getting a cheaper backpack than you would have gotten, and it is still pretty great! And no, I don’t work for them or anything… I just hate seeing everyone so disappointed. Thank you Mathew. Yes, I have one of such daypacks, it was inexpensive and it fits into a pocket in my jacket, that is how small it is. I guess people are disappointed for the reasons you described, and it really looks cool. This was such a great review…thanks for the time on this as well as others. I am going back and forth between this bag and the Paragon. Not just for the pack type but bag size too. Looking for some thoughts on these two bags as direct comparisons as well as your thoughts on bag size. Thanks for the thoughts and input! Hi Bobby, sorry for my slow reply. I am climbing in the Alps right now and do not have the Internet regularly. 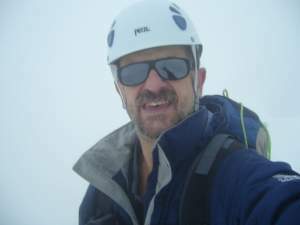 I have just descended from the Casati hut in the Italian Alps close to Bormio, which is above 3000 meters and on my route have seen quite a number of people in the situation like your own, with the father carrying the stuff for children. Those are great packs, reliable brands as you know. I do believe that a pack should be heavy itself to be able to carry the load, there is a number of reasons for that, it must be strong and this implies it is heavy. So probably the Aether AG could be a better option; you have seen it is heavier so this is not necessarily a bad thing. So if I understand correctly, you would need a big pack, so better do not go for the mentioned smaller option (for the Paragon), as for the Aether AG, the smallest is the 60 liters pack. I might really write a text with a detailed comparison between the Paragon and Aether AG. (I did something of this kind with Atmos AG and Aether AG). But if you want a smaller pack with great features, check the new version of Osprey Stratos 50, or check Deuter Futura Vario 50+10. This +10 in the name is extra volume you have if needed (note they have also 60+10 version). For growing kids, there are plenty of great options, please check here. I would warmly recommend Deuter Fox, you will see options 30 and 40 liters. They look incredibly beautiful, I have had them in hands (and I use Deuter packs myself), and those versions for kids have all features of the packs for adults. First I want to thank you for all your reviews! They have been really useful! I still have a question though. In your article your talking about the top lid that converts into a fully functional daypack but did you find the us version in your local store in Belgium? If so, where was it (I’m also from belgium)? If not, do you know any retailer that sends the us version? Hi Louis, I am afraid you will not find the version with the new daypack in Belgium. I just checked again the Amazon link in the text, and it seems they do send the pack to Belgium. Please try at your side. i just got this bag, but it doesn’t have the daylid pack. any idea if you can buy this separtely ? Daylid daypack is available on US market and probably nowhere else; in EU they sell the pack with the old style lid. I would not know if you can buy it separately, but I am rather skeptical about such possibilities. Hi Jovo, thanks for the in depth review on the Aether Ag. One of the features you mentioned was the side access. However, in another review, I saw in a picture that there was actually a J or U access in the front panel (outbacktravel.com). Is this also another US EU difference? Or is it an earlier version? That review was done in May 17. What do you think about top and front loading? Hi David. Thank you for visiting my site. The side entrance is only in this AG 60 pack (and in the Ariel AG 55), while the other two bigger packs Aether AG 70 and AG 85 (as well as Ariel AG 65 and 75) have the J-shaped front entrance. This is the same for all models (EU, US). This is a completely reliable information. Top loading is standard for most packs, so this is fine with these packs, no objection of any kind. The front (and side) access are extra benefits, useful to have, and they add value to the pack, no objection. I read both of your reviews on Aether 60 and Aether 60 ag. Which model do you personally like? Hi Andrew, I would go for the new model. They have added a few things that look really great. The new daypack is a masterpiece, but make sure it is available in the model you purchase; as you realize from the text, this is not always so. Thank you for your work on this review and your website overall. I recently purchased the Aether 70 AG here in the U.S. and have hiked about 30 miles with it so far. I have thoroughly enjoyed the suspension system and the other features of the pack. Even though I haven’t compared ventilation systems of various packs, I have no complaints about the Aether AG. I just know this pack fit be the best out of any other pack I tried on. I really like the way this pack carries and feels on the trail. The main problem I have however, is the squeaking. There is tremendous tension of the pack fabric against the pack frame and of course, the corners of the frame get the most friction. Osprey is testing a powder coated frame which I just tried out on a 2 day trip with a 40 pound pack. The new frame helps, but does not solve the problem. I think the pitch of the squeak went from a high tone to a low tone! I even sprinkled a dry silicone lubricant powder on the fabric before I installed the new frame. I’m now wondering if adding some small, fleixble delrin plastic tubing over the corners where the most friction is, would solve the problem. Then the fabric would rub against the delrin plastic and the plastic would slide as it needs to over the frame. I have a company sending me some samples of a fiberglass, teflon tape which I would wrap around the “squeaky” areas of the frame, but I’m not very confident about the longevity of the tape since the amount of friction is very large and even though it may temporarily fix the noise, I think the tape will wear through quickly. So I’m wondering if you are aware of this known issue and if you have any thoughts about solving this annoying problem. Hi Jake, many thanks for this comment, I am reading it in mountains and do not have regular access to the Internet, this is the reason for such a delay. It is really great to hear about your experience with the Aether 70 pack. I know about this squeaking issue, have been in touch with some other people who were also complaining about it. I am sure I have seen somewhere somebody mentioned such an idea about plastic tubing but do not remember how it worked. Different sizes for harness and hip belt are only marketing. In EU they only sell the pack with one size, and to make things worse, they DO NOT sell harness and hip belt in EU. So if it fits you ok, if not look elsewher. Better look elsewhere from start ans support an EU company. They even forbid US sellers to deliver a hip belt to EU customer. Also they sell the pack with the same name in EU, but without two other features: daypack and external hydration sleeve. I have no problem if a company wants to sell a product with different features in EU. But sell it with different name. They sell it with the same name, you see reviews and advertising about it but when you buy it, it is different. And the price is not. Thank you sorin, I agree with what you are saying. I pointed some of these issues in my review, I can only hope that people will see this and share, and become aware of the situation. It is disappointing to see what they are doing. Though I do not know about this that they forbid US sellers to deliver hip belts to EU. Why would they do this? Strange indeed. Have to correct you about the external sleeve. I described this in detail in the text, please have a look. There is no sleeve as such. It is just a space behind the harness where a bladder can fit easily. This is the same for US and EU versions. But to have the bladder there, you have to pass the hook from the internal sleeve, through the hose port, and then you can attach the bladder externally. But this is a ridiculous solution. And if you really put the bladder there, you do not have ventilation. For me, the only important feature missing is harness / hip belt.This could allow 2 persons to use it or somebody that is L in back and M XL for hip belt can find better fit. Daypack would be nice but not deal breaker. Also, by having removable hip belt instead of single version, this hip belt has no adjustment (for padded part). You are supposed to use different one if it does not fit. Some positive: I tested the backpack with 20kg. for about 30min. Load transfer is excellent.. It can be dialed to have from 0 to almost 100% of load to hips. Back ventilation is ok.
Go to REI for example select Osprey hipbelt and try to order from EU. They don’t deliver Osprey to EU. I have the same problem with US shoes makers that sell in US different width variants but they sell in EU only one. Thank you sorin. Perhaps this is just the REI’s policy because of shipping costs. There are similar examples on Amazon where they do not ship things to EU. I experienced it these days so had to buy things locally. 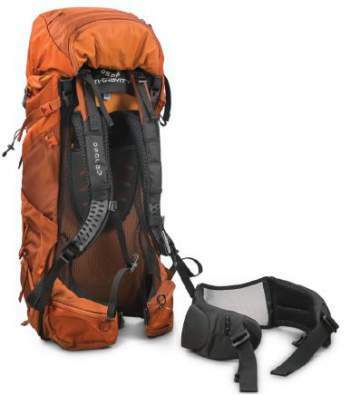 I am considering between this and the gregory baltoro, any insights you could share with regards to the harness and suspension between the 2 packs? The daypack wouldn’t be a factor here for me, I just needed to use the pack for long term travel. Thank you! Hi Royden, I can say a few words, just my opinion. 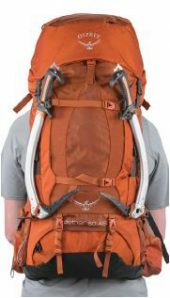 I assume you have the Gregory Baltoro 65 in mind, this is a pack which has stood tests of time. It was tested as a reliable tool to heavy loads, you can read a few field reports here. I have a text about 75 liters pack, you can see it here. This is an impressive tool. 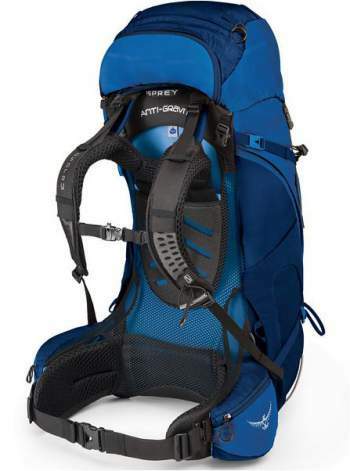 I am pretty sure that Osprey Aether AG cannot match Baltoro when it comes to heavy loads. To see a bit more about this, please read the conclusions in my text Osprey Atmos AG vs Osprey Aether AG. The so-called anti-gravity system and the lack of proper lumbar support are no good when you have a heavy load. Thank you very much for your opinion, I think that seals the deal for me! I am about to order this Aether Ag 60. Before I do I am hoping you can help. My waist measurement is 33″, and my torso 19-20″. I fall between a size Medium and Large. So I am very skeptical on which size to go with. I can’t find one locally where I live to try on, so I will have to order online. Please and thank you! Hi Anthony, from your numbers I think you are the size M for both torso and waist size. There is always some overlapping between the sizes so this should not be an issue. But perhaps you might want to see my reply to Alan’s comment in my text about Aether AG 70. He had a similar question, so my suggestion was to go for bigger because this cannot make any harm. Have a look there. Note also that you probably can change it if it is not completely suitable to you. Thank you! This review was greatly appreciated. Thanks for the review especially about the hydration as it was doing my head in that Osprey video showed an external bladder but on my pack internal seemed to be the only option. I was also told that there was no cover so I brought a separate one only to find one in the lid when I got it home (I’m in New Zealand). I think Osprey needs to work on their instructions a bit. Off on a 4 day tramp with this pack tomorrow so hopefully it performs. I’m wondering about the adjustable harness. Are there physically different harnesses, or do you adjust the one that’s in place by moving the velcro ? Hi Julia, those are physically different harnesses, easily replaceable, and in addition you can adjust it just by breaking the velcro and moving up or down. This velcro connection is in a sort of pocket in the middle of the back, visible in pictures. So you detach the harness there, and you undo the lower connections on the straps, and the connection on the load lifters. The same is with the hip belt which is easily removable. Though, I asked in our local shop and they did not have the harness and hip belt to choose separately, so this will depend on the shop which you have. I went and checked the backpack in 2 shops, here in Germany. The Aether AG backpacks had the lid that can only be used as a lumber pack after detaching from the main backpack. Converting the lid into a daypack and using it like a small backpack was not possible. Then I checked the Ospery Germany website, it also mentions that the lid can be detached and used as a pouch. There is no mention of the ability to convert it to a “Daypack”. It seems that the for the German version, the harness is new but the lid is still old style. Did you hear this complain before? Hi Vik, sorry to hear such news, but I am not surprised, there is a lot of confusion with this pack. So far I did not hear about this particular issue, and it is great that you pointed this out. You know what, I have already been in touch with Osprey as you may see from the text, so I am going to ask them. It is a weekend so I assume they will not reply, but check here in a couple of days, if I get any reply it will be here. As promised, I contacted Osprey and they replied. I added the issue of the daypack in the text above. Thank you for pointing this out. They sell different versions in US and in EU. Unfortunately, the main feature, the DayLid pack is not in the EU version. Instead, they added the rain cover. So the puzzles are solved, but the outcome is not what we wanted to hear. Pity. Is this review based on experience with a pre-production model or a retail one? Were you able to have the hip strap heat moulded to you? This was a preliminary review, and it is updated after I have had the pack in my hands. For the hip belt, you have seen the photo of the Osprey’s oven in the text, I took the picture myself in our local shop, so anybody can use it for any of the Osprey’s packs with such belts. But you do not have to deal with it. This only speeds the process up; if you use the pack a few days it will be molded by the warmth of your body, so do not worry about it. I’m still a little surprised there isn’t much in the way of direct in-the-field info about this new series considering it’s been a available for a few weeks. I guess we’ll just have to wait. Karian Harrison – As far as the heat molding goes, I’ve read that even Osprey representatives say it isn’t necessary. It’s just as effective, and probably better, to just use the backpack for a few days and break it in more gradually. The ‘heat-molding’ is for marketing more than anything. It will come Alan, just give it a time. I have checked at several top shops in my surroundings and they are already excited about it, will have it in March. So the same is everywhere and after that, you can expect more in various sources. As you realize, they still don’t sell it on Amazon. I already mentioned in reply to Kerian, there is no need to use oven. This is like having new shoes, they need time to break in. You are right about marketing effects. Thanks for the great, thorough review. I agree, the Aether AG seems like a highly sophisticated backpack. I agree about the lid/convertible-day pack; it’s great to have a backpacking pack with a ‘built-in’ fully-functional day pack. I am really curious to see how this pack functions overall. The overall system doesn’t really seem consistent with the AG design of other packs like the Atmos. The Atmos has continuous mesh throughout the entire back and shoulders, while the Aether mesh is broken up by the replaceable hip-belt and shoulder harness. I suspect they titled this system “AG” mainly for marketing reasons. While the pack is much closer to the wearer’s back than other AG models, I’m hoping the mesh will provide decent ventilation, especially compared to packs with full-foam/fully-cushioned back support like the Gregory Baltoro, which is exceptionally comfortable and supportive, but has little ventilation. Great review, and please keep us updated as you have more experience with it. So great to hear from you again Alan. I agree with your observations, you feel the system well. The daypack is just a masterpiece, there is nothing close to it in any pack on the market. You are right about systems with mesh, regardless if this is 3D like here or not (like in some other Osprey’s models). My experience with mesh-based suspension is only positive. We shall stay in touch. Cheers.